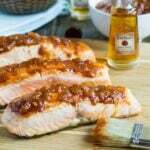 A thick, sweet and spicy barbecue sauce flavored with bourbon and peaches makes a wonderful topping for salmon. Heat canola oil in a medium pot. Add onion and sauté 3 minutes over medium heat. Add garlic and sauté 2 more minutes. Add remaining ingredients and stir to mix. Simmer sauce for 20-30 minutes, or until it thickens up to your liking. Stir every now and then so the bottom does not burn. About halfway through cooking, use a potato masher to break down the peach chunks some. This will help thicken the sauce and distribute the flavor of the peaches. Heat gas grill or grill pan over medium-high heat. Lightly coat tops of salmon filets with oil. Cook salmon skin side up for about 4 minutes. Flip over and cook another 4-5 minutes, or until desired degree of doneness. Once salmon is almost done, coat with a thick layer of barbecue sauce. Serve additional sauce with salmon.